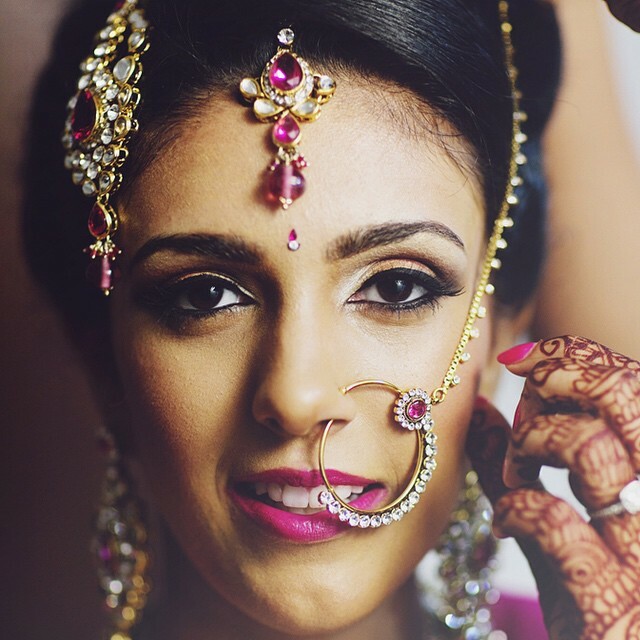 Nath or the nose ring is important bridal accessory and almost all brides wear this traditional accessory. 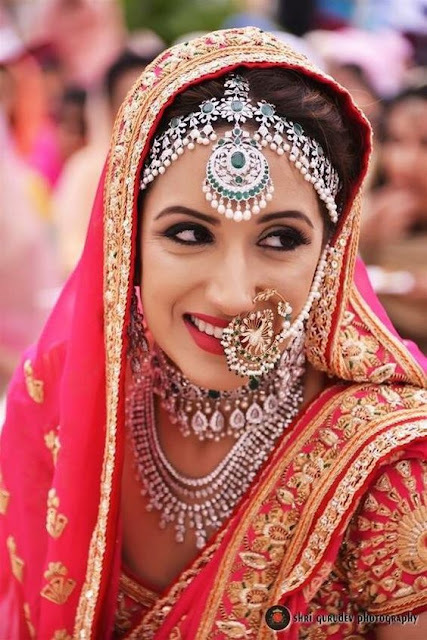 These days when wedding guests turn up wearing jhoomars, matha pattis and maang tikkas the bridal nath is a piece of jewellery which sets the bride apart . 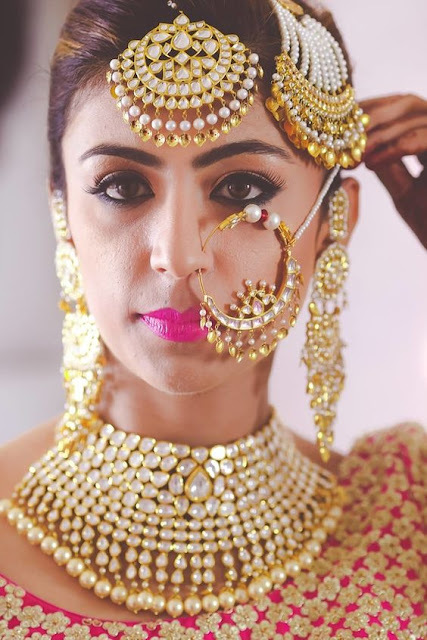 The nose ring is only worn on the wedding day, so all brides should definitely consider adding this accessory to their wedding look as it has potential to totally transform your look. Bridal nath is part of our culture but it was not a big thing years back until Aishwarya Rai flaunted her royal bridal look in Jodhaa Akbar. Even the recent Bajirao Mastani had amazing nath designs for you to get inspiration from. If you are still undecided on whether to wear a nose ring or skip it on your wedding day I suggest you do a trial and see for yourself how it distinguishes you from the rest. 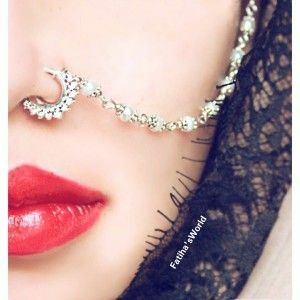 Also you dont need a nose piercing to wear a nose ring, there are many clip on naths available which you can wear and discard off. Always go for a high quality imitation nath instead of a real gold one because you are never going to wear it again, ever. 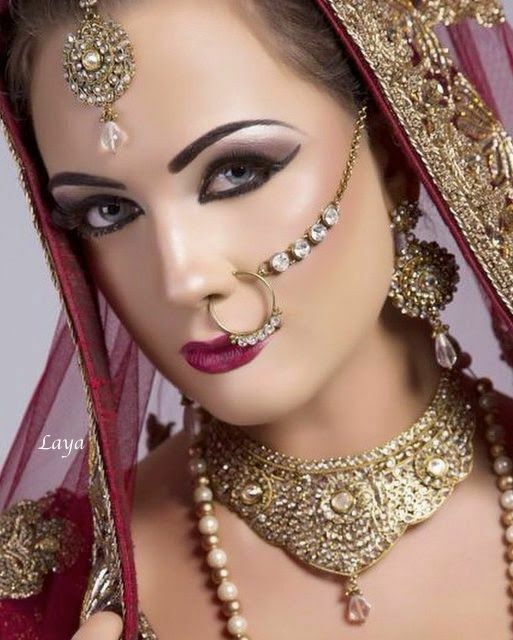 Nose rings are available in a variety of designs, sizes and styles these days and here I bring to you some stylish bridal nath designs for you to help decide on what suits your wedding look best. The latest bridal nose ring trend has a thin hoop adorned with flower droplets and a delicate pearl string holding it. this is available in both cip on and pieced style for you to choose as per your requirement. 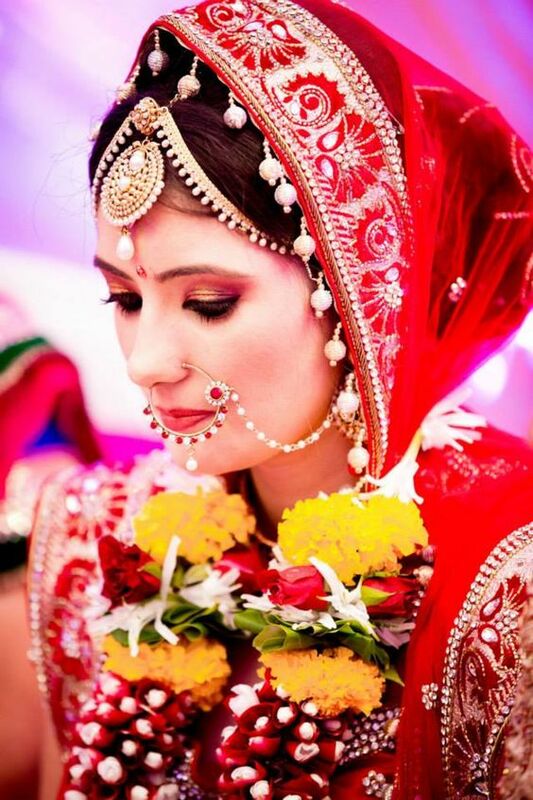 Brides are allowed to go all out and load themselves with accessories because it is their day. 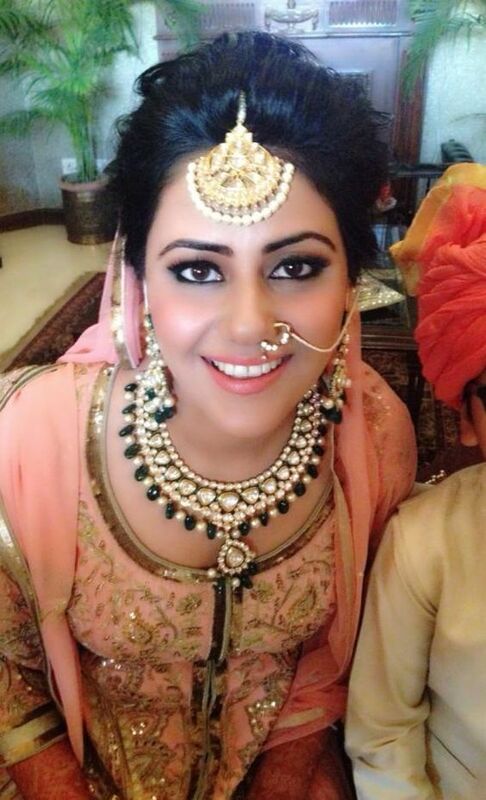 If you dont want anything simple this drool worthy bridal nose ring design should be your choice. This crystal, kundan and pearl encrusted nath is a pure stunner and this bride co-ordinates it with her other jewellery. 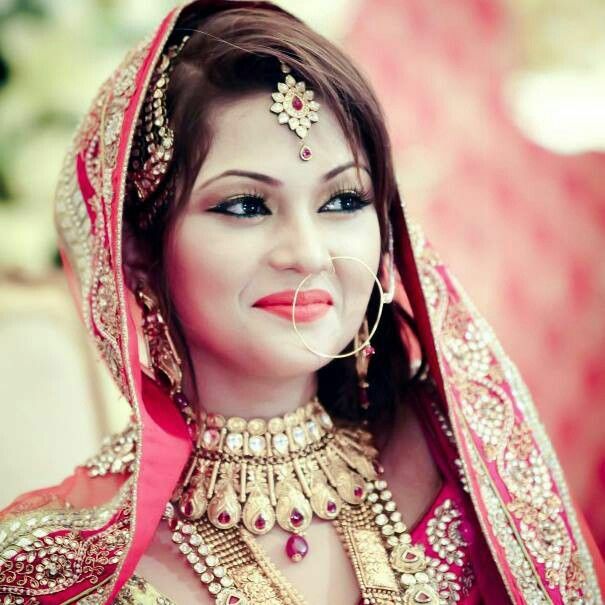 If you want a similar look consider going for a nath in real gold and ask your jeweler to design something matching your bridal necklace set. Dramatic oversized vintage bridal nose rings are a rage this wedding season. If you want to go for an old world grace try these vintage nose rings which have so much going on. If you want oversized but still want to keep things simple go for a studded hoop and a thin plain gold string holding the nath. Popularized by Sonam Kapoor on her Cannes outing the kundan nath minus the chain is a good option if your bridal look is more contemporary than traditional. 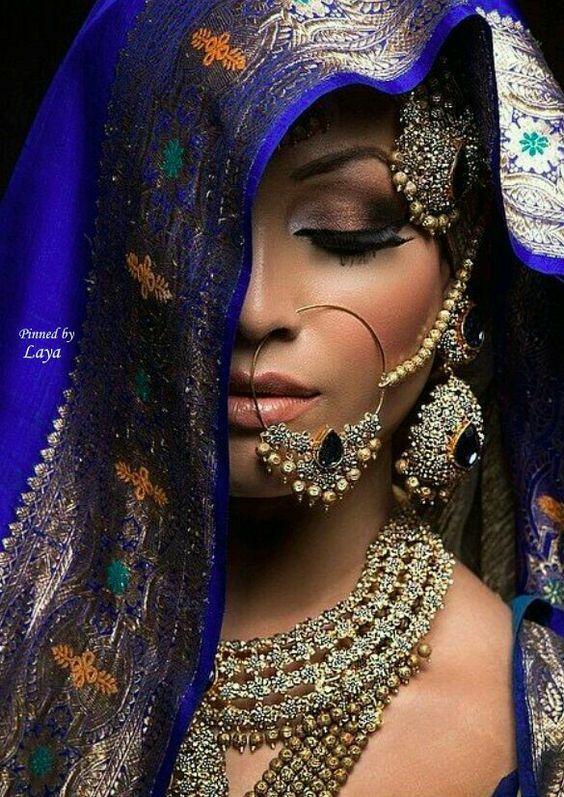 I suggest you try something like this for your wedding reception and use the traditional bridal nose ring for your wedding pheras. This kind of nath will also look stunning for your cocktail or sangeet. 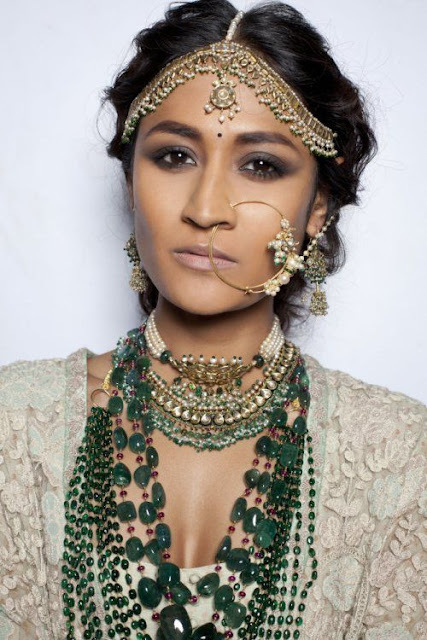 If over sized nose ring is a trend spotted everywhere , the multiple chains trends is pretty new and exciting. 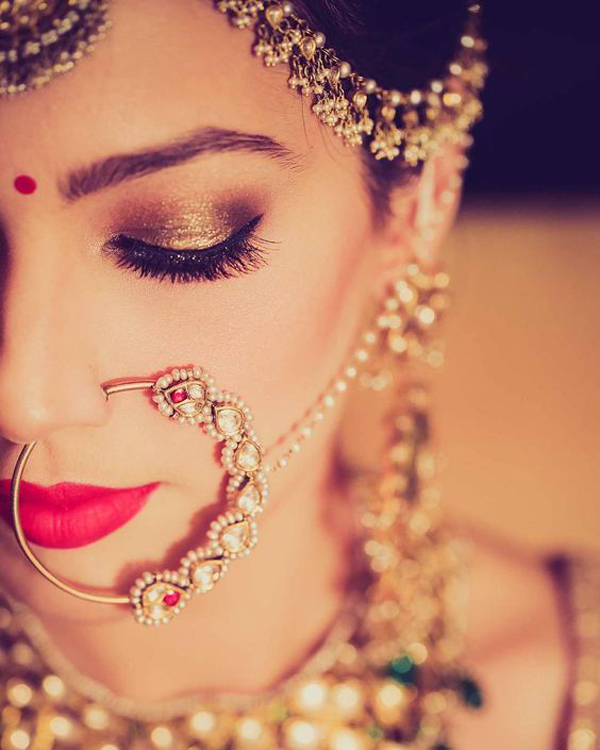 This gorgeous bridal nose ring is sure to be talk of the town and adds so much glam to your bridal look. If you are worried about how to eat and drink with a bridal nose ring on, go for a tiny nose ring with a more elaborate chain. This nose ring can also be reused later without the chain. 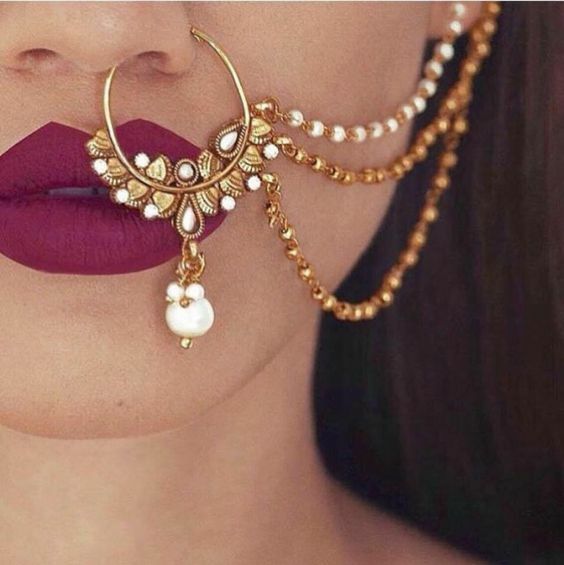 If tiny nose ring isnt your thing go for somewhere in the middle and choose a medium sized nose ring which equally dramatic thanks to small droplets on ring and the chain. Majority of women get left nostril pierced because it is known to have medical benefits according to ayurveda. It is believed that the left nostril has association with female reproductive organs and getting it pierced can ease menstrual and child birth pains. 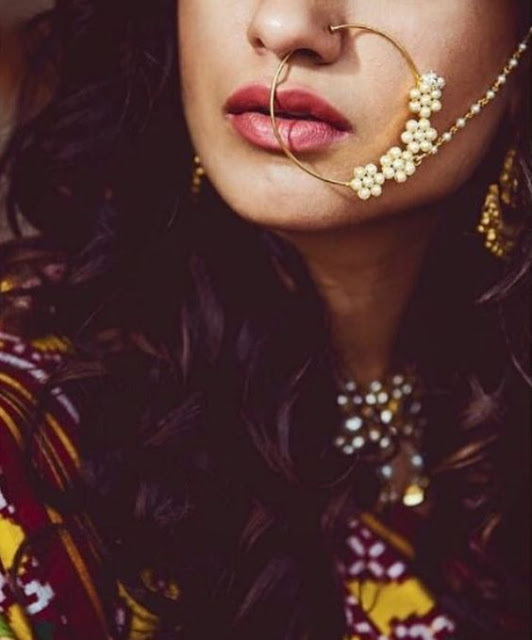 Getting the right nostril or even the septum is also pretty common in India, infact some women get both sides of the nose pierced (this is common in rural or tribal parts of India).